PNE Industries is a manufacturing company that is headquartered in Singapore. The company is active in two main segments: manufacturing electronic controllers and other electronic products on a contract basis, and the manufacturing and trading of emergency lighting equipment and printing materials. The company is currently cash rich thanks to the sale of some subsidiaries, has a history of paying dividends, is solidly profitable and trading at a discount to net current asset value. A combination that warrants a closer look in my opinion. Before we do so time to get a quick feel of the valuation. These numbers are proforma for the sale of the PNE Print subsidiary that has been sold for RMB48.85 million (approximately S$10 million). The sale hasn’t closed yet, but I don’t think that will be a potential problem with RMB10 million already in escrow. Based on these simple statistics it is clear that PNE Industries is pretty cheap, both on an asset basis and an earnings basis. I have compiled an overview of the historical financial results in the table below. As is visible the adjustments required to account for the sale of the PNE Print subsidiary are minor, thanks to the fact that the company already classified it as held for sale. Because of this, only a couple of small adjustments to the balance sheet are required. It should be noted that only the results of 2015 and 2014 have been adjusted by the company to exclude the results of the PNE Print subsidiary. Because of this, the revenue for the past two years is lower while earnings are higher since it was a loss-making subsidiary. So to get the best impression of the current state of the company I think it’s best to look mainly at the last two years. These two years look pretty good, but a large part of that is also caused by the “other operating income” line. In 2014, the company booked a gain of S$9.8 million on a “disposal of an associate” while it booked at S$3.6 million gain in 2015 on favorable FX movements. 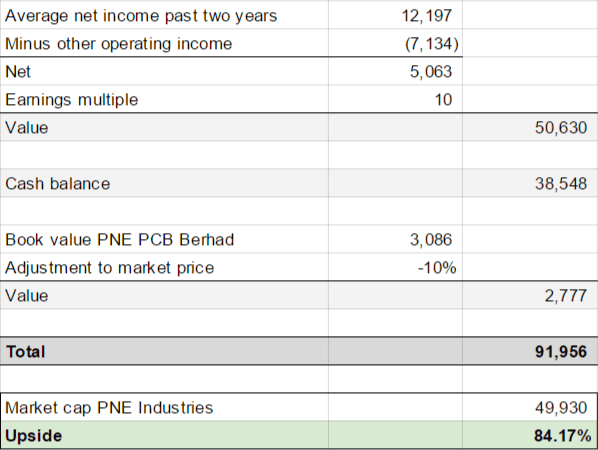 Without “other operating income” PNE Industries would have made on average S$5 million the past two years, and this is the number I will use to value the company. 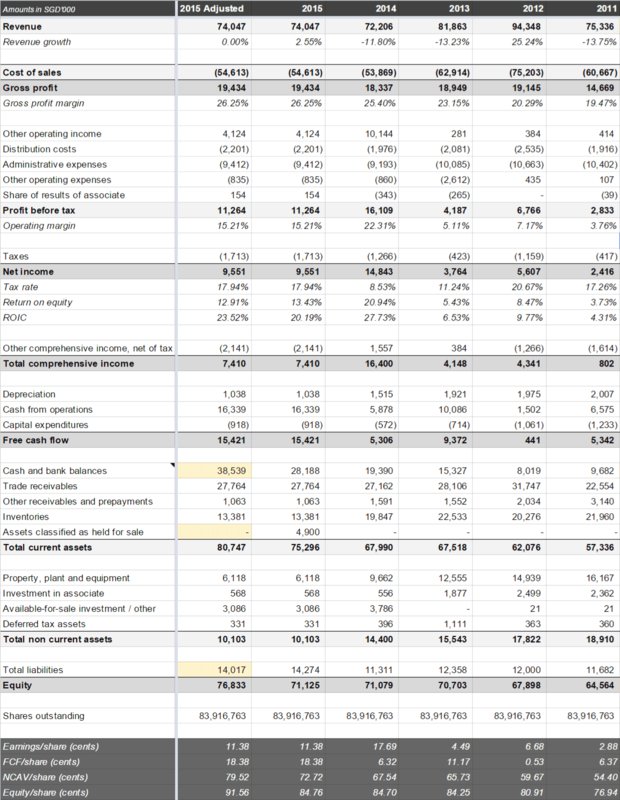 What we can also see in the numbers above is that the company has been able to convert reported income to cash flow without problems, although the cash flow numbers show more variance than the earnings as is usually the case. The balance sheet is also solid. As already said in the introduction, a huge part of it is simply cash while there are also a lot of other current assets such as receivables and inventories while there are few liabilities and no interest bearing debt. Besides the S$4.9 million “asset held for sale” that is classified as current there is also a S$3.1 million non-current “available for sale investment”. This is not the PNE Print subsidiary that already has been sold, but a 13.9% equity interest in PNE PCB Berhad that the company is also looking to sell. PNE PCB Berhad is listed on the Malaysian stock exchange and is down ~10% since the start of the year. The stake isn’t very material compared to PNE Industries itself, but since I’m not trying to cut too many corners I’ll also incorporate this in the valuation. As you can see almost every name on that list is part of the Tan family, and I imagine that there could be more family members that have a stake that is not big enough to make it to the top 20. Because of the high insider ownership, there isn’t much liquidity in the stock since the float is probably just ~20% or even less. With a market cap of US$35.9 million, that means that the float is just US$7.5 million. When you invest in a company that is controlled by a single family you have to ask yourself how you will be treated as a minority owner. I think in this case the answer will be “pretty good”. The reason for this is twofold: most importantly the company has a long history of paying sizable dividends, so you will get paid the same way as the Tan family. 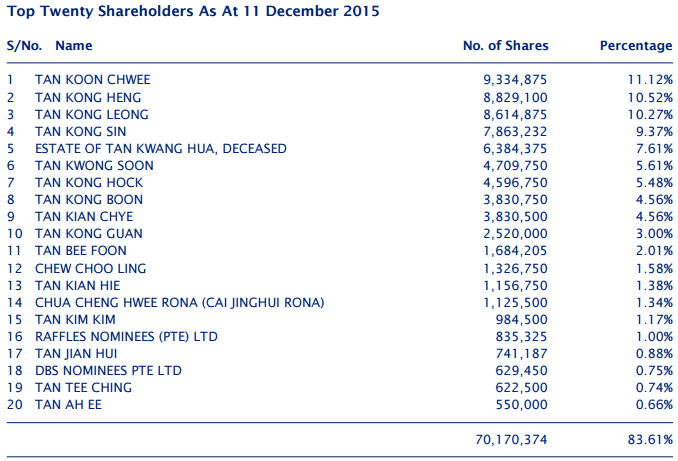 A second reason is the fact that there are a large number of family members who own shares, and not all are part of the companies management since the directors own “just” ~38% of PNE Industries. I think this makes it more likely that they will try to maximize the value of the shares instead of siphoning value away through other means. Given how active they have been selling subsidiaries, a full liquidation/sale of the company might even be possible although there is a hint in the latest annual report that that isn’t that likely in the near future. The company disclosed in its latest annual report that it recently incorporated a new wholly-owned subsidiary with investment holding as its principal activity. So possibly there might be plans to keep hoarding cash that is still on the balances sheet and buy investments. It’s not the worst possible thing that could happen, but it is certainly not the scenario that I would prefer! Based on my valuation of the business I think that PNE Industries is significantly undervalued, depending on your point of view the company either doesn’t get credit for its large cash balance or it doesn’t get credit for its earnings power. It has both, but it is valued like it only has one. The reason for the low valuation is I think mostly related to the fact that the company is family controlled, and liquidity is very low. I don’t see a low liquidity as a problem since I don’t need a lot of liquidity to be able to buy or sell a position when I have some patience. In addition to that, I believe that liquidity will be realized at some point in the future. Perhaps slowly when the company continues to pay dividends, or perhaps fast one day when it the whole company is sold. The fact that the company is tightly controlled by one family is a cause for some concern because it would mean that outside investors have little influence in the case of weak corporate governance. I don’t see any evidence that this is a problem right now, and I believe that the fact that a large number of different family members owning shares will act as a deterrent. Adding this all up I think that PNE Industries is too cheap to ignore. See for more on PNE Industries Paul’s excellent blog here. This entry was posted in Portfolio and tagged BDA.SI on March 18, 2016 by Alpha Vulture. Its cheap. I have been a holder for 2 years now. Even if the stock doesn’t re-rate I’d expect them to dividend out a large part of the pne print gains. They have a great track record in terms of specials. I think I have received (but I should check again), 50% of my purchase price in dividends already and its still damn cheap. I might just visit their European “hq” in the Netherlands. Excellent find and write up. How does one access a copy of the annual report and other company public documents? I couldn’t find anything on their website or elsewhere. Thanks. Thank you for this analysis; studying the stock now with views to start a position soon. Could you please tell which broker you are using to buy shares in SGX? looking at your report on hindside… really great analysis! Thanks, it’s still pretty cheap I think although less upside now than one year ago obviously. Looking at this analysis now, the price has almost doubled from the time you wrote the article!